← An Unexpected Journey to the Southern Hemisphere? A few weeks ago I posted an article about our occultation-chasing trip to the Southern Hemisphere and some of the science behind what we’re doing. Three weeks ago, I didn’t even know which continent I would be visiting. Since then, a lot has happened and most of it is very different than I’d imagined (except for irregular sleep schedules part). For instance, I didn’t expect that my original blog article would be so popular and get picked up by so many places. Nor did I expect that I’d be updating you all on the eve of the main even while sitting on the verandah of the strangest “hotel room” I’ve ever had the pleasure of utilizing, staring out over a lovely bend in the Oliphants River north of Clanwilliam, South Africa. I’ve got a “backie” (aka, large pickup truck) parked with a about five thousand dollars worth of telescope gear buckled, literally into the back seat with a sheet of plastic thrown over it and I had a crash course in driving said backie with a finicky manual transmission on the other side of the road in the middle of the night. Also, I’m having my morning coffee at 1 pm because that’s how we astronomers roll. This situation seems pretty idyllic and charmed until you realize the chaos and painful on-the-fly revising of plans that have preceded today. So, let me back up a bit and hopefully spare you all the gory details. And boy are they gory! Our team of about 55 people split is between Mendoza, Argentina, and Clanwilliam, RSA. Due to time differences and management styles, the two teams have been largely independent of each other. The African team (twelve telescope teams of two plus half a dozen helpers, floaters, and camera crew) flew into Cape Town on Monday. The ambitious schedule of meetings, practice sessions, and so forth quickly became overly-optimistic as people dealt with jet lag, canceled hotel reservations, cell phones which wouldn’t work in Africa, broken-down vehicles, and a notably non-functional telescope. There was chaos, both general and specific. From what we hear, the Mendoza crew is enjoying a similar level of excitement though with different particulars. Ground tracks S01, S03, and S05. I spent Tuesday night staring at this a lot. We’re here to do a job, but that job is hugely constrained by the local conditions. 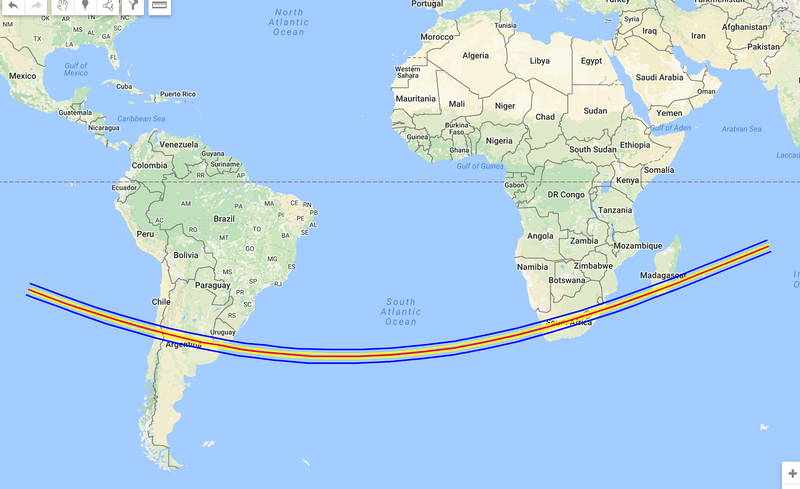 The occultation shadow passes in a roughly east-west stripe across the Earth and we want to observe it from as many different distances from the most likely center-line as possible (spread about 150 kilometers on either side). Each telescope team (two people) is assigned to a portion of this shadow path. The horizontal location doesn’t matter, but the distance from the centerline (the most likely path of the shadow) is important. This “picket fence” approach gives us the best chance of at least one team catching the shadow as it goes over. Team #13 (Jason and I) had volunteered for a “high-sigma” line, i.e., one which is much less likely to see the shadow with the rationale that it was better to put the most experienced observers in the high probability regions. Accordingly, we were assigned S01, the southernmost track. This is called the 3-sigma line because it would be very unlikely to have the occultation shadow pass that far from it’s predicted center-line. There is a 99% probability that we wouldn’t see anything, but it’s important to cover all the region like this. Jan’s farm Padavlei where we would have deployed S01. Go talk to the land-owners, they say. What could possibly go wrong? Jan’s farm from ground level. After 36 hours in Cape Town, deployment positions were finalized (at 1am on Wednesday). After a few (very few) hours of sleep, Jason and I headed north to scout out our location. Our S01 line crossed no less than ten different roads, so I spent the wee hours of Wednesday scouting on Google Earth and found a couple possibilities. The first was on the R45 between Malmesbury and Moorreesburg. I was dreading the salesmanship necessary in asking local farmers about using their land and/or local police stations, but it turned out to be okay. As an added plus, I got to introduce myself: “Hello! My name is Charles and I’m with NASA.” The first farm we stopped at was exactly on S01. After driving back and forth to a few other farms, we found Jan, the farm owner who quite willingly gave us permission to use his land and even escorted us back there and showed us around. Mission accomplished! S01 is covered. We reconvened Wednesday evening in Clanwilliam, a small town in Western Cape about three hours north of Cape Town in the arid citrus-and-wine growing region. Everyone had a story to tell about searching for spots on their line and they were nearly all positive. And now, it was just a matter of a little more telescope practicing and waiting for the main event on Saturday morning. 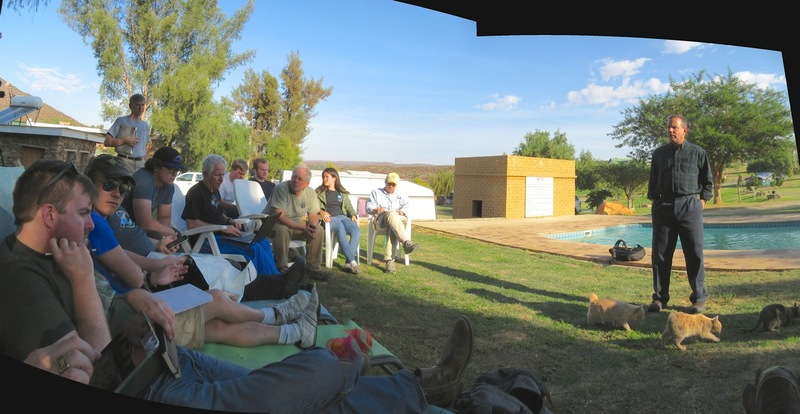 We had another practice night all together at the Rondeberg Resort 20km north of Clanwilliam, finally got on-field, and retired for the night. I planned a rest day on Thursday to explore Clanwilliam a little bit and marshal some sleep for the coming days. Team meeting at the Rondeberg. It’s less fun than the lounge chairs would make it appear. As Sun Tzu said, the first casualty of any battle is the plan, and this scientific battle was no exception. There was great uncertainty in the weather forecast and a large number of people were becoming uneasy about this. Even with great locations, having clouds covering the star during the crucial minutes would scuttle this million-dollar science experiment. 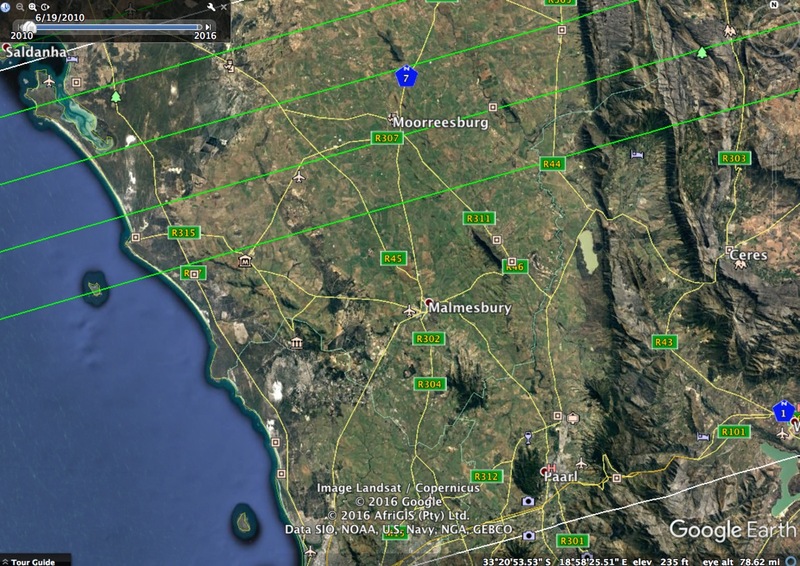 The best observing solution was to send everyone 600 km east across the Karoo plateau and find new deployment sites along some of the north-south roads there. The best logistical solution was to keep our hard-won deployment positions in the Western Cape and hope for good luck with the weather. The original (Wednesday afternoon) deployment plan for the South African team. Stripes are the lines, placemarks are the sites everyone found. Most of this is no longer correct. The updated (Friday evening) deployments grouped into eastern and western clusters. Hopefully the weather is good in at least one of them. The less said about the decision making wrangling, the better. The end result was that the low-probability outlier lines were largely abandoned and those teams sent east to cover the higher probability regions in a new climate zone. Our team was now ZA-east and ZA-west. These teams (on about an hour’s notice in some cases) started driving east at sunset over notoriously bad roads infested with washboard and wildlife, to find accommodations and new deployment sites. Despite being on high-sigma team, I was reassigned from S01-west to S13-west which happens to be the occultation centerline and most likely spot to see something. My partner changed from Jason (who was playing a major role in the eastern re-deployment) to Simon who is the guy who calculated where the occultation centerline would fall. Logistically, my change of plans involved moving from a hotel in Clanwilliam to the Rondeberg. My telescope deployment site changed from Jan’s sheep pasture two hours south to a flat spot in a dirt road a hundred meters from my bed. My hat is off to my colleagues who are still out there scouting and stressing on very little sleep, but I appreciate being able to relax and unwind a bit. So, what happens now? We’re at T-14 hours until the event and our die is pretty well cast. Even yesterday was probably too late for major re-jiggerings of the plan, but the ingenuity of this team has produced miracles in the past. Our dress-rehearsal observations last night (from 3-6am) were flawless. Our site in the middle of the dirt road was very dark and dry and the southern Milky Way is staggeringly beautiful. The hardware and software worked perfectly. It was gratifyingly boring. What will happen tonight? Will the weather forecast prove correct with 90% cloud cover in Clanwilliam or will we miraculously have gloriously-clear weather? Will all the last-minute efforts of the all-night-driving ZA-east teams prove unnecessary or will their diligence end up saving the day? Which team (if any) will actually catch the occultation? Stay tuned to find out. In the meantime, the proprietors here at Rondberg Base are cooking us a Braai tonight (which apparently involves a lot of grilled meat). That will be nice. 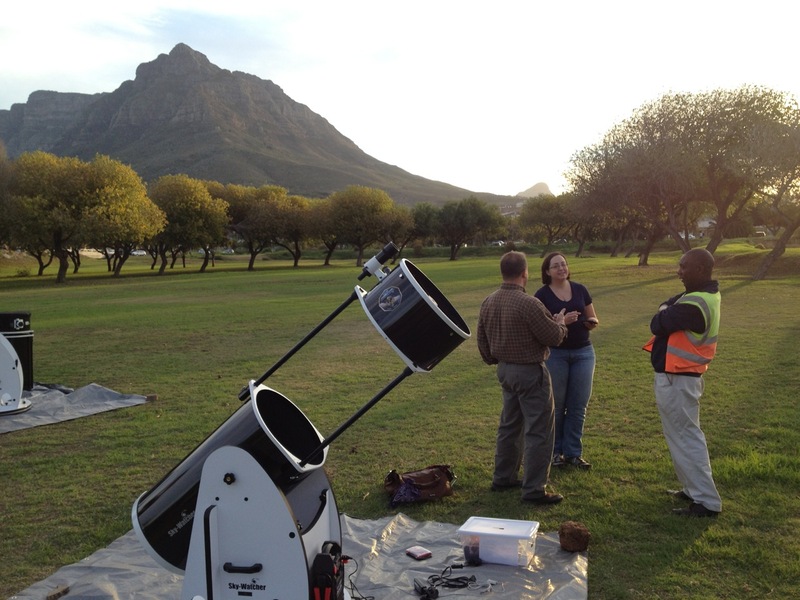 This entry was posted in abroad, astronomy, exploration, sedentary and tagged 2014mu69, capetown, clanwilliam, KBO, new horizons, occultation, Pluto, rondeberg, science, swri, telescope. Bookmark the permalink. 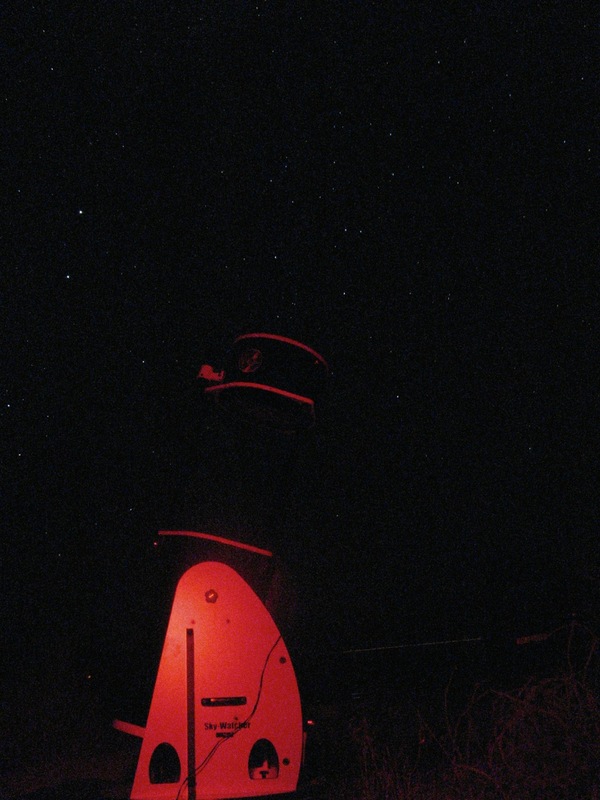 Envious of your starry evenings, live in N.J. Hope your teams get the sightings you need. Good Luck. Thanks. It turned out okay. I need the occasional evening under spectacular skies like this to remind myself why I started doing this in the first place. The southern sky is amazing and you should come down to see it someday.